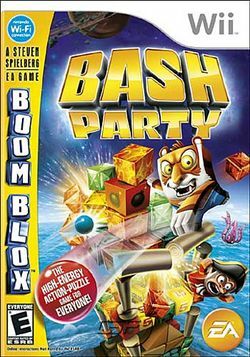 Boom Blox Bash Party (known as Boom Blox Smash Party in some markets) is a physics-based puzzle video game that was developed by EA Los Angeles and published by Electronic Arts for the Wii video game console. It is a sequel to Boom Blox, and was released on May 19, 2009 in North America and Europe. The game features more than 400 new levels, and players will be able to download new levels and upload their own custom-created levels to share online. Its development began after the completion of its predecessor, and it was formally announced on January 28, 2009, and will be designed by film director Steven Spielberg. The gameplay of Boom Blox Bash Party resembles the original's, but also features new mechanics. It also has less emphasis on the shooting mode, which the developers commented was their least favorite mode of play in Boom Blox. It was created as a part of a deal between Electronic Arts and Steven Spielberg to make three original properties, though it does not count as one of the three original properties. This page was last edited on 10 July 2017, at 11:27.